Today I looked, I mean really looked at my wedding ring. At one time it had sparkled and shone, but today, I noticed it was really dull and darkened. I quickly cleaned it up and was amazed at how willing it was to shine again. And since I can't keep myself from thinking of life as a series of analogies, I of course began to think of how symbolic my treatment of this ring is towards my marriage. I don't ever really forget the ring is there. It's lived on my finger for 4 years now and it will remain there - Lord willing. I move it around quite a bit. I fidget with my ring and spin it around on my finger constantly. 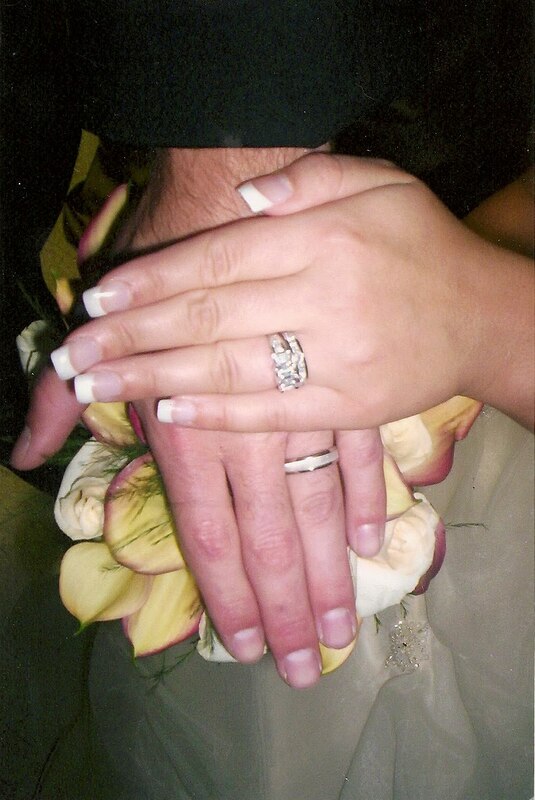 When my hands are cold, I sometimes switch my engagement ring to my right hand and wear both rings separated. When I do that, I quickly remember how it felt to wear that engagement ring. I would stare at it often - knowing the lifetime promises were going to quickly follow my receiving it. I feel quite sentimental about it all right now. I'm not one for shows like The Bachelorette - not one to get caught up in the fairytale of it all. I do sometimes wonder how those couples will fare after it all ends. How could you possibly succeed after all the dramatic romance and perfectly orchestrated dates are no longer the norm, and real life sets in? And it makes me think of how sometimes that is how our own engagements and dating can be. So much romance and excitement, and then, before you know it, you find yourself 4 years and a baby later in the midst of a very real life and the hands that are wearing those rings are just a little more worn out looking. Ironically, my own experience of marriage and love involves so much more reality that the reality show. But tonight, right now, my ring is shining. And when I think of the man whose finger I also placed a ring on back then, my heart shines a bit too. But maybe his awareness of these feelings of mine is lose somewhere in the daily living. Perhaps the requests of "could you do the dishes/laundry/etc." crowd out affectionate expressions. Maybe the love I have for him appears somewhat dull to him. Perhaps like my ring, it needs a little shine from time to time. I think I can take care of this ring a little better. And I think I can create a little more sparkle in my marriage as well. And I will. But right now, I'm delighting in the comfort of the permanency of it all. I'm finding pleasure in the indention that remains under my rings and finding pleasure in my promise to walk this life with this man. And just as the ring has become quite a part of my actual hand, my husband has become a part of my actual being.